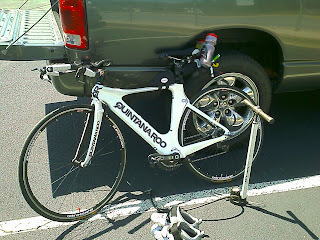 My current hydration setup consists of an XLAB Carbon Wing with 2 XLAB Carbon Gorilla bottle cages. I also have a Bontrager Aero Race Pack that I've used twice, once during the 2010 Ironman Augusta 70.3 and again during the 2011 Gulf Coast Triathlon. Both experiences made me think that there must be a better option. I purchased an XLAB Torpedo aluminum mount last week. I took the opportunity this week to install the mount and take a few pictures of the process. I opened the package and perused the instructions. Perusing to me means looking at the instructions without actually reading them. I took the partially assembled, straps attached, into my garage and placed it on top of my bar extensions. The bars were too close together to install the mount as designed. I'd have to widen the space between my handlebar extensions by about 1/2-inch. I should have done this when I used my aero pack because it was a bear to get on and off. I placed a paint stirring stick across my handlebars and under the extensions to keep them aligned. I loosened, adjusted, and re-tightened one extension at a time to ensure I kept the alignment. I found that I may need to apply a small amount of up or down pressure to the extension (or the stick) to keep things lined up. I later realized that the handlebars and extensions are notched so this may be a mute point. I already had a Zefal WIIZ side opening bottle cage to use. I may replace the cage to one that is less bulky. As I contemplated adjusting my extensions I searched the Internet for other installation options. I found that some riders forgo the straps and use tie wraps. Since I want the capability to easily install and remove the mount I elected to move the bars. Even with the longer Polar Bottle installed there is plenty of room on the extensions to grip the bar while riding. As I see it, this type of mount offers several advantages, the greatest of which must be efficient bottle replacement during an extended ride or race. I also recently bought 2 new Polar Bottle insulated water bottles. I think I'll like these better that the CamelBak Podium Chill bottles I already have. The primary difference in the Polar and CamelBak bottle is the valve. The Polar bottle uses the standard, easy to clean, water bottle valve. The CamelBak bottle valve is self-sealing to reduce spills and splatters making it difficult to clean properly. The Polar bottles are made in the USA and cost about $5 less than the CamelBak bottles. The CamelBak bottles are made in China. Update: Today was my first ride using the torpedo mount. I used the small water bottle. At the 7 mile point the bottle popped out of the cage and fell to the street. Obviously the Zefal cage will have to be replaced. I also noticed that using my right hand to adjust my front derailleur took a bit getting used to. Other than that, it worked like a charm which means less reaching around behind me to access my wing mounted water bottles. One Down - Nineteen More Weeks To Go!